Back in July, Nail School News announced the national winners of the 2014 SkillsUSA trade competition. We recently had the opportunity to chat with Dorothy House, an instructor for the high school-level bronze winner, Natali Carmona-Garcia of Metropolitan Career & Tech Center in Little Rock, Ark. Back in July, Nail School News announced the national winners of the 2014 SkillsUSA trade competition. We recently had the opportunity to chat with Dorothy House, an instructor for the high school-level bronze winner, Natali Carmona-Garcia of Metropolitan Career & Tech Center in Little Rock, Ark. Metropolitan Career & Tech Center is a “total participation” school that infuses SkillsUSA curriculum into the classroom. The campus totally and completely supports SkillsUSA, and the students are encouraged to be involved in the competitions and the leadership activities. We asked House to tell us a little more about the school and her success with these young, hardworking students. How long have you been an instructor at Metropolitan Career & Tech Center? I’ve been an instructor for Metropolitan (Little Rock School District) for four years. Does the school have a separate nail tech program or is it a general cosmetology program? 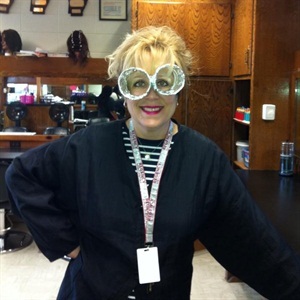 Our program is a cosmetology program. How long is the program and how many hours are required? Our students are allowed to attend the program during their junior and senior years, clocking on average, 650 hours for their time in our program. What is your own background in nail technology? Prior to becoming an instructor, my nail technology experience was natural nail care and acrylic and fiberglass nails. What is your favorite nail lesson to teach? My favorite nail lesson would be the health and safety features of any nail service. What aspect of nails seems most challenging for your students and how do you help them overcome it? The most challenging aspect of teaching nail care would be undoing bad habits.The bad habits include no sanitation procedures, incorrect application procedures, and the use of non-professional products. Once my students complete a thorough assessment of health and safety practices, I help them overcome bad habits by requiring the practice of sanitation and disinfection for every procedure performed. My students are exposed to professional products through student-lead research of select companies, and our school district provides quality products for classroom instruction. Each student is encouraged to buy her own professional acrylic brush, which facilitates the learning of the maintaining salon tools objective. Each student is exposed to video instruction, classroom instruction, and regular practice with a professional rubric for all areas of nail care. How do you help your students prepare for the SkillsUSA competition? Preparing my students for competition is addressed during the first week of school by exposing them to SkillsUSA videos, PowerPoints, and photographs from the previous years. Leadership roles are encouraged, and being able to quote the SkillsUSA Pledge is part of their assessment. All leadership and teachers here at Metropolitan are advocates for SkillsUSA and support all students in the contest arena, which in turn supports me in the preparation of my students for competition. One of my important tasks in preparing them for the actual competition is making sure they arrive there with the appropriate supplies, encouraging them to do their best no matter what, and instilling in them that each competition requires their best. I have an obligation to not only teach my students, but also to train them for success. One of the highlights of my job is to have students with special needs learn a craft and acquire an arsenal of life skills that allows them to be successful in the salon. To learn more about Metropolitan Career & Technical Center, visit http://www.metrocareertech.org/.